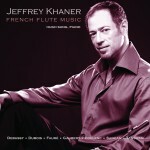 This is the fourth release in Jeffrey Khaner’s “Flute Music” series on AVIE, following American Flute Music (AV 0004), British Flute Music (AV 0016), and French Flute Music (AV 0027). His album of music by Brahms (the ‘clarinet’ sonatas) and music by both Clara and Robert Schumann was released in 2005 – AV2075. 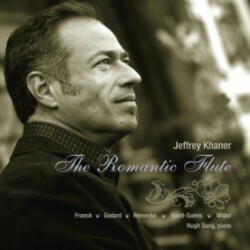 Jeff is one of today’s most distinguished orchestral musicians. He is also a commanding soloist. 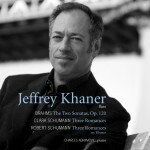 This new CD offers a feast of fascinating music. Widor’s Suite was composed for the famous French flautist Paul Taffanel. Benjamin Godard, like Widor was on the staff of the Paris Conservatoire and his untimely death robbed him of the opportunity to hear the first performance of his Suite. The German composer Carl Reinecke lived a long life and he was a prolific composer, especially of chamber music. Saint-Saëns’ Romance started life as a piece for flute and orchestra but later he created a version with piano accompaniment, again for the flautist Taffanel, with whom he toured. The Franck Sonata needs little introduction, and versions of the famous violin sonata, are heard regularly in the concert hall in arrangements for flute, viola and cello.